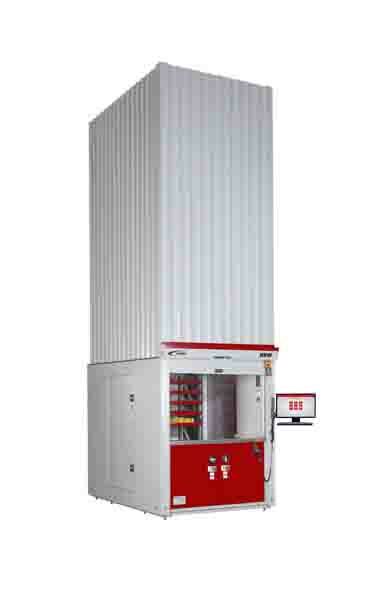 The first vertical lift module that has the capability and user friendliness to be called a vending machine. The AutoCrib® VLM Vertical Lift Module system provides up to 80% more inventory storage than traditional shelving and requires only 47 square feet of floor space, giving you more room for manufacturing, warehousing, kitting operations, shipping/receiving, quality control, and offices. You can save up to 1,400 square feet per 25ft VLM system vs. traditional shelving. That’s $14,000 saved per year at a conservative $10/sq. ft. warehousing cost. Pay thousands less than you would for competitive machines and still have a superbly equipped vertical storage system. Our VLM system is designed with features that will dramatically increase your operational effectiveness and deliver measurable results. AutoCrib® has the most advanced technology for inventory management. More than an automated shelf, it provides item-level inventory management, advanced permissions-based access controls, and powerful reporting capabilities that provide managers with actionable information. Intuitive controls let you easily select products by a tray, part number, or description. Items are automatically retrieved with the push of a button and trays are automatically returned with your next selection. Our modern automated industrial vending systems are an excellent showpiece for plant tours and customer walkthroughs. Today's tech-savvy customers expect best-in-class manufacturers to have automated solutions. Get greater throughput with fewer mistakes, and eliminate frequent cycle counting and costly physical inventory shut-downs. Our solution automatically records every transaction, meaning you always have up-to-date inventory counts. Our well-equipped vertical lift storage systems equal or exceed the floor space savings and inventory control of significantly more expensive ASRS (Automated Storage Retrieval Systems) and vertical lift systems at a very affordable price. Our patented full-width extractor for storing and retrieving trays is engineered to be remarkably simple. With fewer moving parts our system has outstanding dependability for long-term 24/7 operations and costs significantly less to maintain. Vertical lift storage systems are very flexible systems. You can use your existing boxes, totes, and bins — no special bins or product carriers are required. Inventory can be retrieved quickly and routed in sequence to your order pickers. A single operator can run multiple vertical lift module systems virtually eliminating operator dwell time. You can see a sustainable 20-40% increase in picking productivity. The system is pre-integrated with our industrial vending machine product line. It is a massively scalable platform that allows you to start small and grows aggressively with your manufacturing initiatives. The AutoCrib Vertical Lift Module (VLM) systems offer more flexibility than other ASRS solutions. Unlike large ASRS systems that require a complete overhaul of the warehouse or production area, VLM systems are modularized and easy to implement. This means you can easily integrate into an existing system or gradually expand your automated storage solution over different phases. The modular construction gives you the ability to change the unit’s height to meet future needs and capitalize further on your initial investment. Handle the same workload with fewer employees in the tool crib or storage room, allowing your highly-paid experienced workers to be completely focused on the job. Increase throughput or extend business hours while maintaining the same number of employees. Advanced permissions-based access controls track warehouse transactions to specific employees, and encouraging them to take responsibility for each item they obtain. Enclosed storage reduces the danger of objects falling on employees. Items are presented to employees at a comfortable ergonomically correct workstation. Every item is in the “Golden Zone” with no need for employees to bend down, reach up, or climb. Prevent dirt, dust, and debris from accumulating on your inventory. Enclosed inventory stays cleaner and helps keep supplies, parts, and tools in good condition.